A lack of a diminished total of white blood cell count in the peripheral blood cells: Aleukemia consists of varieties of diseases in which the white cell count of the blood is not normal or is so inadequate that it can even result in death. 1. A neurologic disorder marked by loss of the ability to understand written or printed language, usually resulting from a brain lesion or a congenital defect: Alexia is also called "word blindness", "text blindness", and "visual aphasia". In addition to the previous applicable terms for the word alexia, research has also provided us with "optical alexia", "sensory alexia", and "visual alexia"; however, it is not the same as "motor alexia" (anarthria), in which there is a loss of the power to read out loud although the significance of what is written or printed may be understood. 2. A disorder in reading ability: Alexia is differentiated from dyslexia, which is a developmental problem in reading. Strictly speaking, lexus and its derivatives refer to speech, not reading, because they are based on the Greek verb legein, "to speak", and not on the Latin verb legere, "to read". Current usage of alexia appears to reflect an etymological error that has been accepted for so long that to insist on correcting it might be useless. Oxford University Press; New York; 1996; page 30. Being without breasts: Amastias result in the absence of the mammary glands either through surgery or because of a developmental defect. 1. A woman or girl soldier; hence, a large, strong masculine-type of female warrior: In full uniform, Mable resembles an Amazon because she is mannish, physically powerful, and seems inclined to be ready to fight anyone who gives her any trouble. 2. Etymology: derived from Greek mythology, a female warrior "without a breast" because of the story that the Amazon women, warriors of Scythia, Greece, were said to cut off (or burn off) one breast to make it easier to use a bow when shooting arrows during a battle. The Greek fable illustrates the word Amazon that comes from a-, "without" and mazos, "breast". 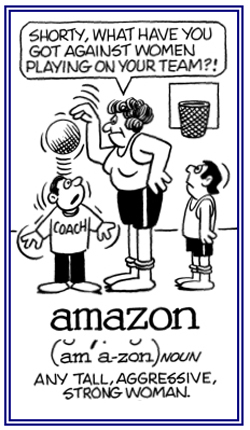 See this fictional and humorous origin of Amazon on the internet by going to this page. 1. In Greek and Roman mythology, the food or drink of the gods thought to bestow immortality: Do you think that foods like figs dipped in honey are ambrosias and will give us immortality? 2. Something especially delicious to taste or smell: Nadine always thought her mother's baked cakes smelled and tasted like ambrosia. 3. A fruit dessert made of oranges and shredded coconut and sometimes pineapple: The recipe for ambrosia did not specify the exact amounts of each ingredient. 4. Etymology: borrowed perhaps through Middle French ambroysie, or directly from Latin ambrosia, from Greek ambrosia, feminine of ambrosios of the immortals; that is, gods, from ambrotos, "immortal" (a-, "not" + Greek brotos, "mortal" [from earlier mrotos] + -ia, a suffix that forms nouns). An absence of or an abnormal stoppage of the menses (menstruation): Amenorrhea is a cessation of menstruation or a woman's menstrual-monthly cycles. Normally, amenorrhea ends naturally in middle age with the beginning of menopause (time when a woman's ovaries and the lining of the uterus prepare an egg for fertilization). Without normal mental abilities; such as, a congenital intellectual deficiency or retardation: Lionel was diagnosed with amentia because of his psychological disorder which was characterized by confusion, disorientation, and occasionally stupor. Absence or nonexistence of the uterus: Ametria is a defect that is present at birth in which a female's uterus is missing. Not related to nor caused by microorganisms; such as, bacteria, viruses, algae, fungi, and protozoa: The medical laboratory determined that Devin's amicrobic illness was not a result of any known single-celled organisms. A reference to something that is too small to be seen through a microscope: The biologist was unable to see the amicroscopic bacteria even with a normal microscope; however, he could see them with a much more powerful microscope later. A loss of the ability to express oneself with signs or gestures: The amimia that Nicolas was experiencing resulted in his inability to express any of his thoughts even with gestures or signs. A disorder of language that is known as amimia is characterized by a person not being able to express ideas by nonverbal communication; such as, making gestures or understanding what gestures mean. 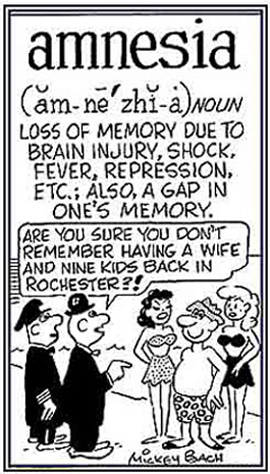 A partial or a total loss of or an inability to remember: Susan's mother's amnesia was shown by her inability to recall past experiences or being unable to remember who she was. 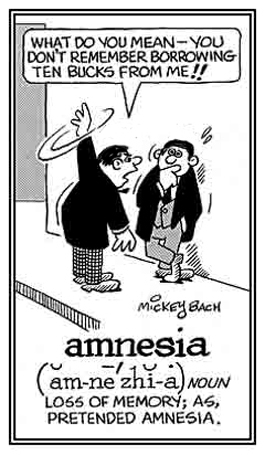 Amnesias can be caused by shocks, psychological disturbances, brain injuries, certain kinds of illnesses, or old age. Showing page 8 out of 23 pages of 340 main-word entries or main-word-entry groups.